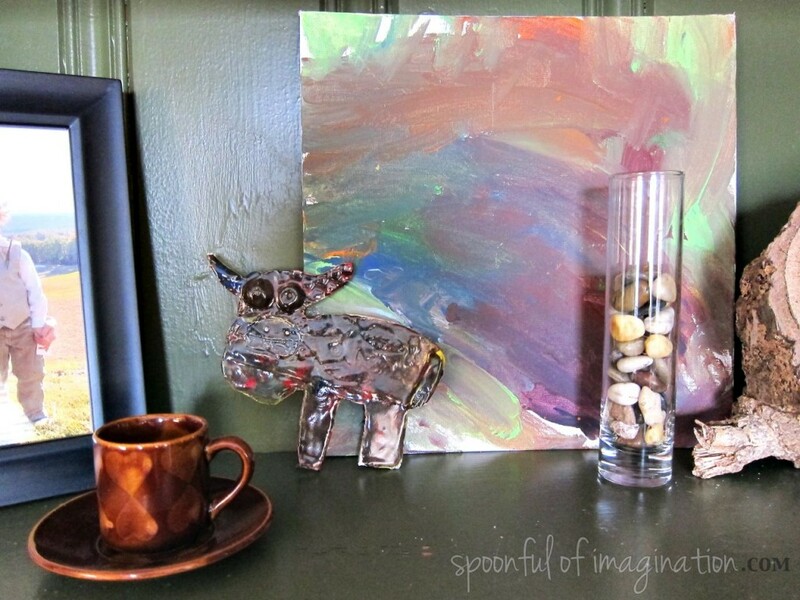 I love using my kids’ art to decorate our home. I think it is such a special way to celebrate and applaud their creativity while capturing and appreciating this special season of them being little. I know I have shown you my art wall in a lot of posts. There are only two pieces on my art on that I did. I’m sure you can’t tell which two they are ;). 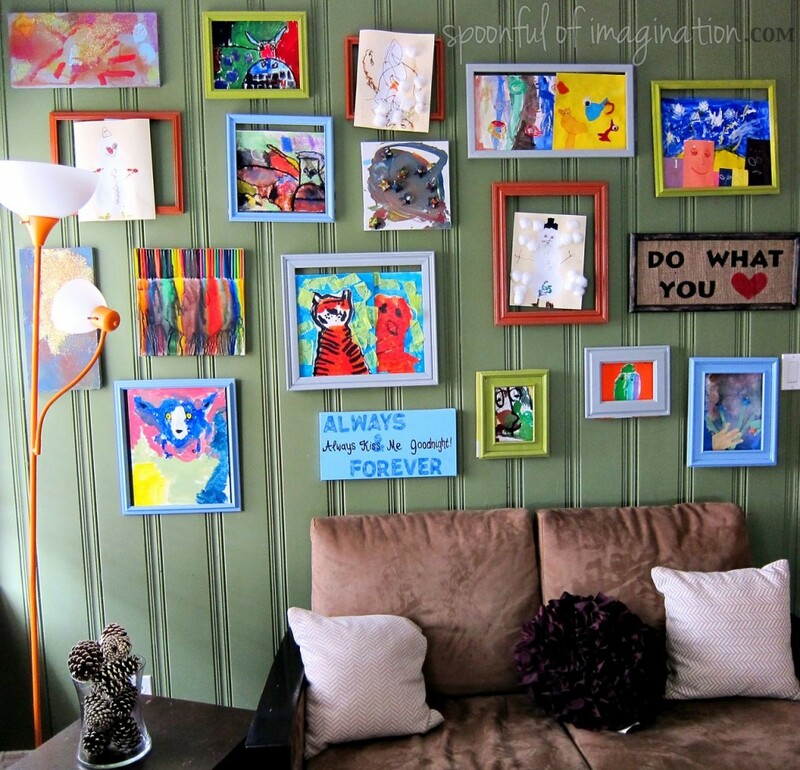 Most of the art on this wall my boys created at my favorite local art studio, Out of the Box Art Studio. Have you heard of them? Although we do a LOT of art around my house, I send my boys to a summer art camp at Out of the Box Art Studio every year. They have the best projects and the kids always have so much fun. Most of the teachers are friends of mine and I grew up taking art from the Owner & Director, Juli. They are so sweet and encouraging with all of their students. 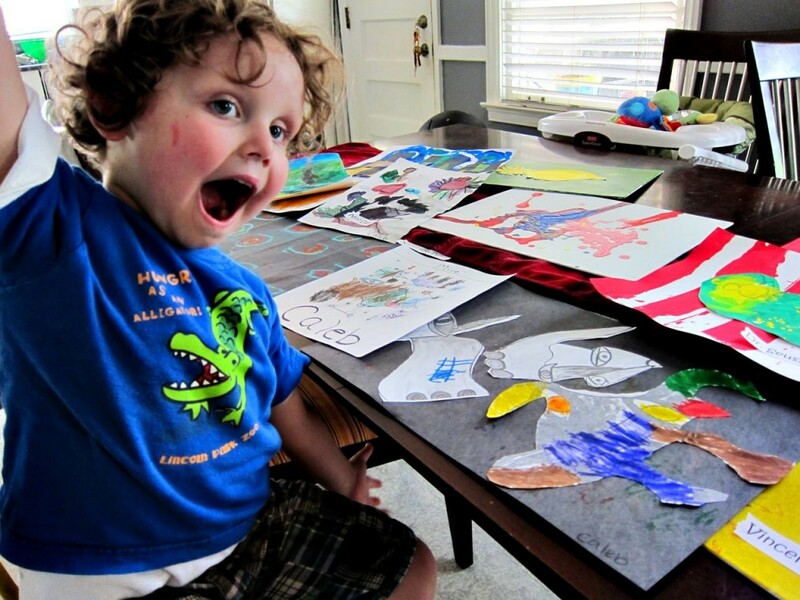 Caleb, in the summer of 2011, showing off all his artwork from camp. This was two years ago. I can’t believe how much he is has grown. Look at those curls! I miss them! 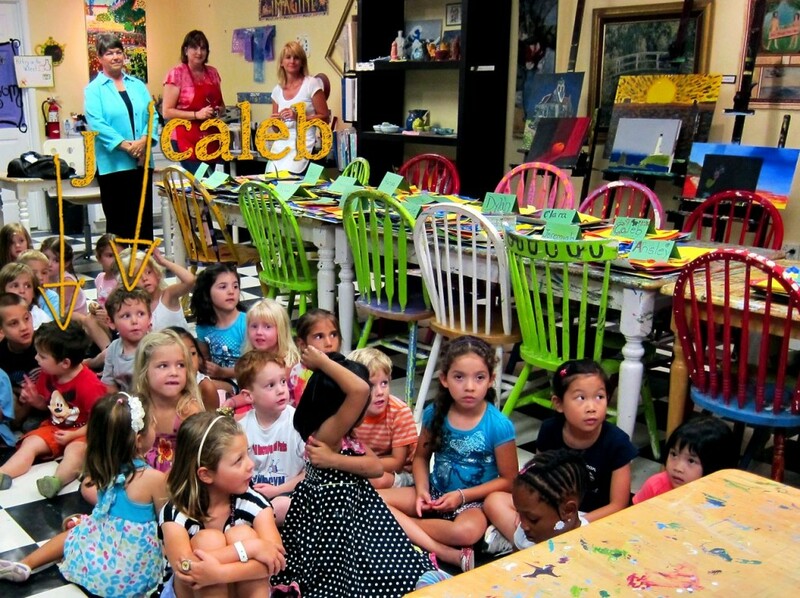 You can see my J and Caleb (at camp last summer) ready to present their artwork at the end of camp Open House. I worked at OOTB for a little while. I got to the genuine love of art from the owners and staff while I was emerged in this great environment weekly. I loved it. Now that I stay home with my kids, I love to send them there for a great experience. Along with my art gallery wall, I used my boys art pieces from camp to help stage all my shelves while our house is on the market. Their pieces are my favorites. I have already signed my boys up for a camp this summer, and I can’t wait to see what they bring home! 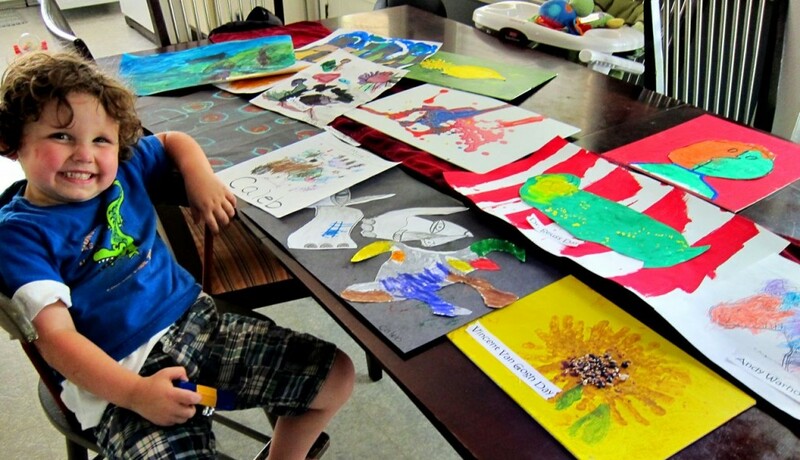 As well as having awesome summer camps, they have art classes all year-long. This studio teaches potters wheel, clay hand building, drawing, oil painting, acrylic, watercolor, and multi media. They have after school classes but also classes during the day for homeschoolers. I have got to get my boys in one for this coming fall. If you fall in love with this place, as I have, you could use them to host a birthday party or any other special event as well. 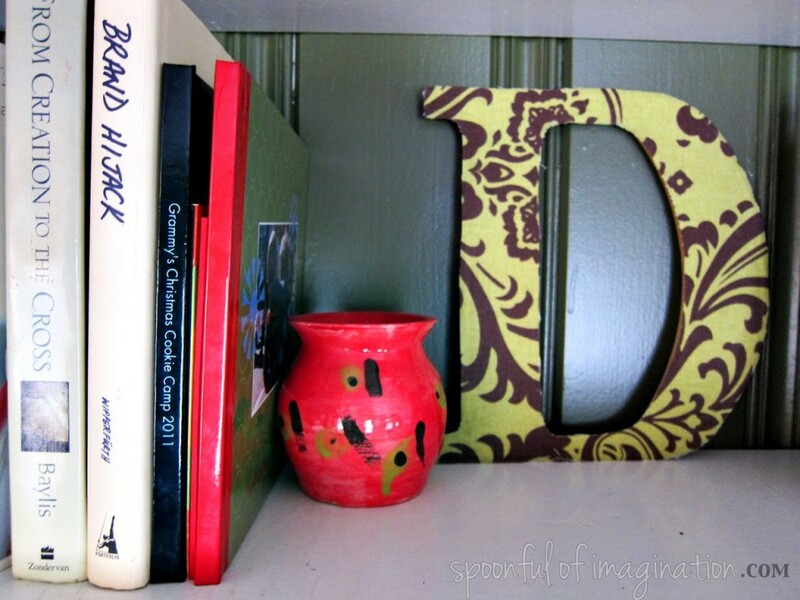 I had a bridal shower there years ago, where we all painted a piece of pottery for the bride. It was a fun, hands on, and a personal gift to give. Their newest feature is to do mobile classes where they will come to you. So unique and awesome! I love how all this can be for ages preschool all the way to adult. Are you craving to do some art now? I have some REALLY good news for three of my local metro Atlanta readers. 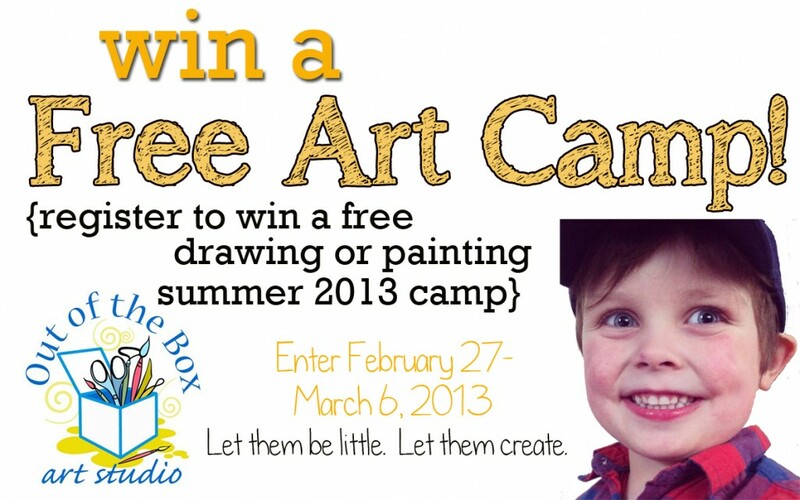 Out of the Box is graciously offering up a FREE drawing or painting summer camp to three of my readers! The camps are registering right now. You can view them all on Out of the Box’s site here. You all know that I am that hands on mom, and I get nervous about leaving my kids in new places. I trust Out of the Box and am so honored to be able to help promote them to all of you. Please let the rafflecopter widget load below, and enter in as many ways possible to win a free drawing or painting camp for this coming summer! We will be in contact with the winner (via email) on March 6th, to let you know how to register for your camp. 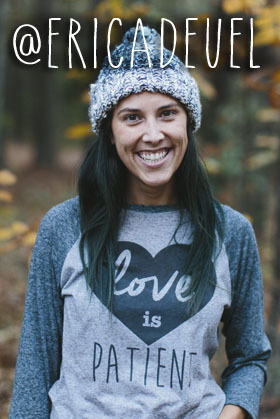 Juli is offering up one free camp registration to a preschool aged child, one to an elementary, and one to a tween/teen. (Each camp is valued at $95-$135 depending on the age group) So, three camp spots are up for grabs! Please be sure to answer the question which age group camp you would want, so we can find three winners! If you are new here, please feel free to browse around and check out my site. I love to write about my family, my crafts, and the outings we do. I feel if you add a spoonful of imagination into every area of your life, it will be a more beautiful life! 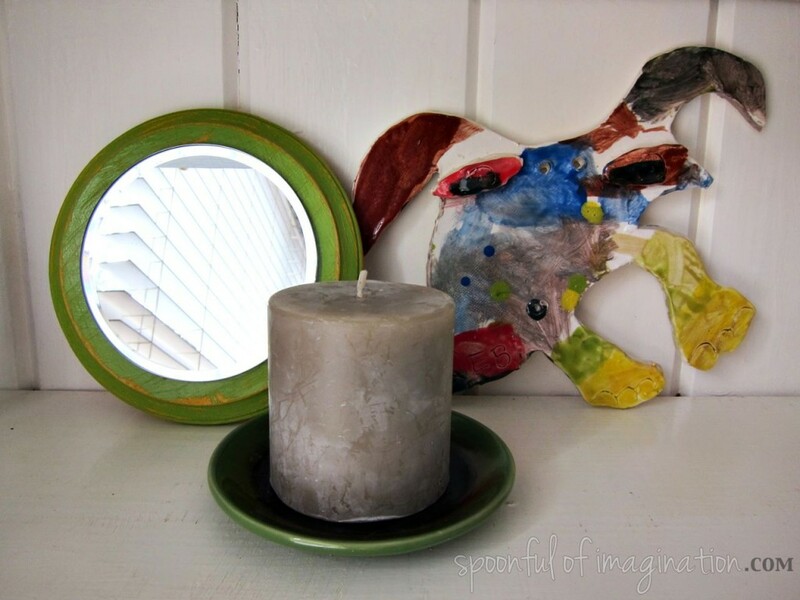 If you would like to see a post about one of my crafts go here, one of my homeschool activities go here, or one about my family go here. I definitely want to send Aiden to art camp! He would love it. Hmm I don’t have that many childhood memories involving art because I was the least artistic child ever! Ha. I remember when we were kids we used to use things we found outside to make art…we’d grind up flower petals and blades of grass and draw on the pavement in the hot summer sun! I LOVE art, and I’m trying to pass that onto my little guy! Thank you! Young and seeing how great they looked out of the kiln. I loved art as a kid. I remember hiding myself in my room and creating presents to surprise my family for every holiday. My girls love art too! Favorite childhood memory of art: Hmmm. I seem to recall spending a great deal of time one afternoon painstakingly copying my sister’s signature onto the wall of our basement stairs, carefully crafting each loop and curly-que so that my mom would believe her “perfect” younger daughter had finally crossed the line. It passed the test, and my sister got completely busted, with a bonus spanking for lying about her behavior. I didn’t fess up until Easter dinner 20 years later, where a near riot exploded after my confession. How many pictures still have your whole family that emotional 20 years later??? That’s pretty good art! hahahaha Holly! I just laughed out loud!!! That is AMAZING!! Incredible story!! Growing up my summer camps always involved art and I viewed them as little snapshot pieces of me at that time in my life. It’s a fun way to remember where we’ve been throught what we’ve done! These art momentos are how I remember my childhood and now how I remember my daughter’s! My favorite is painting where the sky is the limit on what, where, and why you just want to paint! I would love to win this for one of my twins. He LOVES art and “doing crafts”. Like Erin, I was/am not artistic, so I’m not sure where he gets it from, lol. My mom is an amazing artist. As a child, I recall such excitement when I would ask her to draw me something. I would say she is a late bloomer when it comes to her true artistic potential. She takes an artist class that is geared for seniors. I would really like some pointers (instruction) for my kids and I to see where their talents are. As for me, I always enjoyed art and have a few neat pieces I really should display around the house. I just feel that some instruction is lacking. Creativity is rarely a problem! This would be such an enjoyable and memorable experience. Though I do not have many memories of art in my childhood, my kids would LOVE this! Hope I’m a winner! My daughter would love art camp! She is very creative and needs an outlet for her energy and talent. I never had art camp as a young child but I took art every year they let me in high school. Making the Ten Commandments plaque at Bible School with macaroni letters! I love that idea Cindy! Thank you so much for sharing what a special memory! Making picture paperweights in kindergarten for Father’s Day. My dad kept all of our paperweights all these years and recently returned them to us. Great memories!